(2013). Photocatalytic Coating Using Titania-Silica Core/Shell Nanoparticles. International Journal of Bio-Inorganic Hybrid Nanomaterials, 2(3), 407-422.
. "Photocatalytic Coating Using Titania-Silica Core/Shell Nanoparticles". 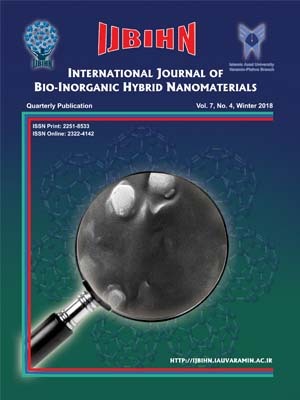 International Journal of Bio-Inorganic Hybrid Nanomaterials, 2, 3, 2013, 407-422. (2013). 'Photocatalytic Coating Using Titania-Silica Core/Shell Nanoparticles', International Journal of Bio-Inorganic Hybrid Nanomaterials, 2(3), pp. 407-422. Photocatalytic Coating Using Titania-Silica Core/Shell Nanoparticles. International Journal of Bio-Inorganic Hybrid Nanomaterials, 2013; 2(3): 407-422. The photocatalytic coatings were prepared via incorporating the modified titania nanoparticles into epoxy-based inorganic-organic hybrid coatings. Titania nanoparticles were first synthesized from tetra-n-butyl titanate using sol-gel methods by two different calcination treatments, i.e., in mild condition (80°C) and 500°C. The formed anatase nanoparticles were further modified as Titania-Silica (TS) core/shell structure. Characterization of the samples was carried by X-ray diffraction (XRD) analysis, Scanning Electron Microscopy (SEM), Transmission Electron Microscopy (TEM), Fourier transform infrared spectroscopy (FT-IR), Energy-Dispersive X-ray (EDX) spectroscopy and UV-Vis spectroscopy. The decomposition of methylene blue (MB) exhibited high photocatalytic activity for the titania nanoparticles embedded with silica phase in core/shell structure. In a comparative study using a commercial P25 titania from Evonik, the synthesized titania samples showed lower size nanoparticles and more uniform distribution of nanoparticles into hybrid binder. However, the degree of anatase crystalline was lower which results to lower photocatalytic activity.